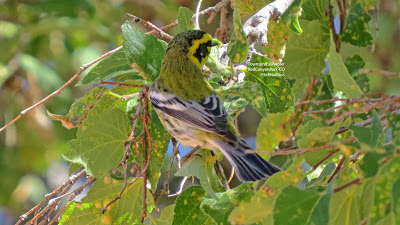 Two days ago I birded Red Canyon Park which is about 8 miles north of Canon City. Primarily a pinyon-juniper habitat, it does have a normally dry gulch that drains much of this city 'mountain park' so a number of deciduous trees grow in it. 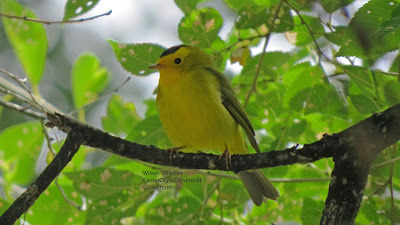 Hackberry trees do well in the very sandy parts of this gulch and that is where I found a lot of warblers--mostly Wilson's with some a number of first-of-season Yellow-rumped, a few Townsend's and Orange-crowned Warblers plus a couple of Ruby-crowned Kinglets and Chipping Sparrows. I did not have my cameras though I was able to get close enough to get a photo of a Ruby-crowned Kinglet with my Samsung Galaxy 3 smartphone that only has 4X zoom.